I am very proud of myself for achieving the natural drug and intervention free birth that I wanted. My preparation and determination really did pay off. I didn’t do it alone though; my birth team played a significant role in helping me to achieve this. Would I do this again? Straight after birth I would have said ‘no’ or ‘yes, but book me in for a caesarean!’. But today my answer is ‘Yes. And next time I want to relax and enjoy it more, appreciate the wonderment of birth and savor those precious first moments with my baby’. Throughout my pregnancy, I put considerable thought and energy into proactively planning for a drug free birth without medical intervention. I understood the increased likelihood of these things happening in the hospital setting, so my focus was on doing everything I could to be healthy, informed, in tune with and trusting of my body and baby, and to protect my birthing choices right to the end. I read books about pregnancy and birth, watched footage of positive birth experiences, did pre-natal yoga, meditated, and towards the end had some massages and acupuncture. I stayed fit and healthy and exercised right to the end. While I chose not to birth at home as I was a little anxious about the possible ‘what ifs’, I wanted something as close to ‘a home birth feel within a hospital’. So I put my trust in the Women’s, but remained somewhat skeptical and stayed informed so I was ready to defend my choices during pregnancy and birth. As part of my preparation for birth, I attended independent birth education classes run by Di Diddle, which included a particularly inspiring session by Rhea Dempsey. I knew that continuity of care would be a key element in maximizing a positive birth experience. Unfortunately I didn’t get into the COSMOS caseload midwifery program at the Women’s, so at each appointment I saw a different midwife. I therefore chose to engage a private birth attendant who could provide this continuity of care. As a solo mum by choice, this support was particularly important for me. The only other person I wanted at my birth was my mother. The first time I spoke on the phone with Erika Munton, I felt her positive energy. We soon met for a brief chat and I knew she was the perfect fit for me. Erika naturally relates to people with warmth, empathy and respect. She is genuine, positive and affirming. She connects well with people and has a way of making everyone feel relaxed and at ease. I see this as being very important for hospital births since she is able to listen and communicate well with everyone involved to delicately balance the often-competing interests between the birthing woman’s wishes and hospital protocols. While she educates and empowers women to achieve a natural birth, she is non-judgmental and very respectful of a woman’s individual birth choices. It all started around 6am on Wednesday 7th November 2012. I was 41 weeks and 2 days pregnant. I had delayed going to hospital for monitoring because I believed everything was ok and I didn’t want to be bullied into induction. As it turned out, I spontaneously went into labour just hours before my postponed hospital visit, so I didn’t need the monitoring after all – just as I had thought! It began with an ache in my lower back, which came and went at irregular intervals. I had two pieces of toast; little did I know that this would be my last food till Thursday! I went back to bed and dozed between contractions, which came roughly every 7-9 mins. I knew that labour was on! I stayed in bed with a hot water bottle for as long as I could. By mid morning the pain was increasing and I realized that I wouldn’t be able to think or do anything for much longer, so I focused on finishing packing and getting bits and pieces done, and wrote down any jobs that could be passed onto my family. That took quite a bit of brainpower and focus! My mum arrived at 12.30pm. I was already having to focus inwards, close my eyes, press into my lower back and breathe deeply with each contraction. The contractions came every 3 minutes and while I didn’t feel like birth was imminent, the frequency of the contractions indicated that things were progressing. Erika came at 2.15pm and I felt relieved that she was there. She suggested I eat which I didn’t really feel like but I knew I needed the energy. I’d already thrown up a few times so I didn’t have much of an appetite. I only managed to get down a mouthful or two before throwing up again. I’d prepared a huge bag of snacks, but only consumed the sports drinks. The next few hours are a bit of a blur. I spent a fair bit of time lying on my left side, so Erika helped me into other positions, like sitting on the ball, leaning on the kitchen bench, and putting my arms around her shoulders while circling my hips. I needed Erika or my mum to push firmly into my lower back during each contraction. At a certain point the TENS device became useless because my back pain was so great that I couldn’t feel the pulses, even when it was up high. At around 8pm I started to vocalize quite loudly. I was sure that wouldn’t be me! Breathing was no longer enough. It wasn’t something I had much control over; the sounds just came out of my body from nowhere. I wanted to stay at home for as long as possible but in the end I needed something to change. In some warped way I wanted to believe that being in hospital might make the birth more imminent. I also worried that I wouldn’t be able to make the trip if I waited much longer. We arrived at emergency at 10pm. I held onto my mum and kept my eyes shut. I didn’t want to be disturbed by the environment or transition from home. I was soon taken to a curtained off intake room for 1.5 hours while they stuffed around and eventually gave me a catheter because I hadn’t managed to wee all day. I was then wheeled off to the labour suite where my first priority was to have sterile water injections to help my back pain. 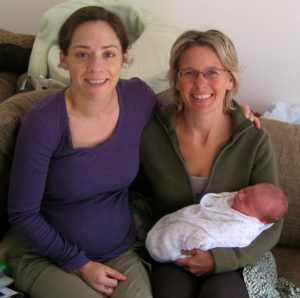 I was very fortunate to get a midwife who really stuck to my birth plan. She was calm, quiet, and relatively uninvolved. I never felt like she was trying to speed things up or get the birth done within a certain time constraint. She respected my wish to not know how dilated I was and to instead use encouragement accordingly. She did regular Doppler checks but didn’t give me updates unless I asked. Overall she was non-intrusive and this really helped me to focus inwards. Eventually my waters broke and I was encouraged that things were happening. I then got in the bath, which felt peaceful. Apparently I was there for about 1.5 hours, but it felt like 20 minutes. My vocalization got a lot louder as the contractions became more forceful. During the strongest contractions my body seized up in a way that felt completely out of my control. My belly, back and pelvic area clamped into a tense state and no amount of relaxation or breathing seemed to help. It bothered me that I wasn’t able to relax into these contractions. At times the pain was more than I could bear. After a strong contraction I’d say “I don’t know how I am going to keep going”. Yet I couldn’t get past that thought to do anything about it. Instead I would drift inwards to some sort of still paused moment of silent coping where I restored some energy. Rather than spend mental energy trying to solve how I would go on, I drifted away to another place. Despite the intensity of the pain, I never asked for drugs. I thought of them briefly but only in the context of them not being an option I would choose. I told myself that I WAS getting through it, I HAD got through it up till now, more time had passed since the last time I doubted myself, so the evidence suggested that I WAS coping. The labour went on and on and on. The baby’s head was transverse, so it wasn’t in the right position. I moved around but found it really hard to transition from one position to the next. After some bigger spirals on the ball, another catheter, and more time in the bath, a final examination was done and I was told to start pushing. I went onto all fours and bent into a lunged leg with each contraction. Erika told me that his head was starting to become visible – I knew it was finally going to happen! The stretching was very strong and despite wanting it all over, I knew that I needed this stage to go slowly so the stretching could happen gradually. Then just as I thought I was going to explode, his head came out. I was so relieved – it would really soon be over! His body came out with the next contraction, at 7.35am (26 hours after labour began). He was gurgly with amniotic fluid, so they briefly rubbed his face and body. He then started crying more clearly and looked around as if to make sense of his environment. As soon as I saw his face I knew he was a boy. I was scared of picking him up too high in case the cord was short! He proceeded to do a huge poo all over my leg! I waited till the cord had stopped pulsing and cut it 13 mins after birth. I was then able to raise him and cuddle him properly. As he lay on my chest, he slept and grizzled and I was relaxed and sleepy, exhausted from the huge ordeal. I dozed off a bit, it was like time was standing still. My voice was tired and croaky from the hours of howling. Two hours passed and the placenta hadn’t come out. I really wanted it to come out naturally, particularly because I had managed to avoid drugs up to that point. Eventually they convinced me to take oxytocin to get it out. I lost 665 mils of blood, which is considered a post partum hemorrhage.